Review: Image that you are in an unknown cave and the ceiling of the cave just collapsed… you have to stomp through millions of the largest scorpions you have ever seen… you are getting chased by what you think are terrorists… you are stranded in the middle if the desert… what would you do? In this adventure story this all happens to a fourteen year old boy named Sam. I love this book, the Scorpion Sting, which is part of the Extreme Adventures series. This is the fourth book in the series, and I cannot wait to read the rest! As the story begins, the ceiling of the cave falls and although Sam isn't injured, his brother, Nathan, is terribly hurt. Nathan put his life in Sam's hands to go find help before its too late, but it isn't as easy as it sounds. 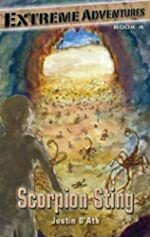 Sam has to walk through millions of HUMONGOUS scorpions, save a baby kangaroo, avoid being eaten by ferocious dogs, run away from terrorists, and still find a way to save his almost-dead brother along the way. When all seems lost, he meets this boy that is about Sam's age. This boy saves Sam's life, although this boy will need saving somewhere farther into Scorpion Sting. This book is definitely a book that will keep you on your toes and always wanting more and more. Scorpion Sting is outstanding, wonderful, action-packed, and more. I love how the author makes the main character, Sam, always think about what to do and know exactly what to do in tough situations. I also believe that having another character, such as a teenage boy, come along sometime within the text is very clever. This teenage boy knows the area very well and can almost get the two boys out of trouble. While this boy is trying to lead himself and Sam to safety, he accidentally leads them into a life threatening situation by accident. I love how the text always keeps the reader wondering and guessing. "They were dressed as United States soldiers and carried automatic weapons with state-of-the-art, infrared night sights. It didn't make sense. There wasn't a war on." Statements like these always had me hungry to keep reading on. You may also think that the whole book will be named after what it looks like on the cover, but it really is not. The title is named after a very important event or situation in the book which you do not find out until the end. Scorpion Sting is very exciting, surprising, and adventurous. I have nothing but good things to say about this book. I would definitely recommend this book to young readers like me. I give this book five stars. Review written by Abigail (6th grade student). We would like to thank Raab Associates, Inc. for providing a copy of Scorpion Sting for this review. Have you read Scorpion Sting? How would you rate it?